Germaniae L’Empire D’ Allemagne distingue suivant l’etendue tous les etats, principautes et souveradnettes qui passent ou qui ont passé jusque a present sous la nome D’Allemagne sur les Memoires les plus Nouveaux. 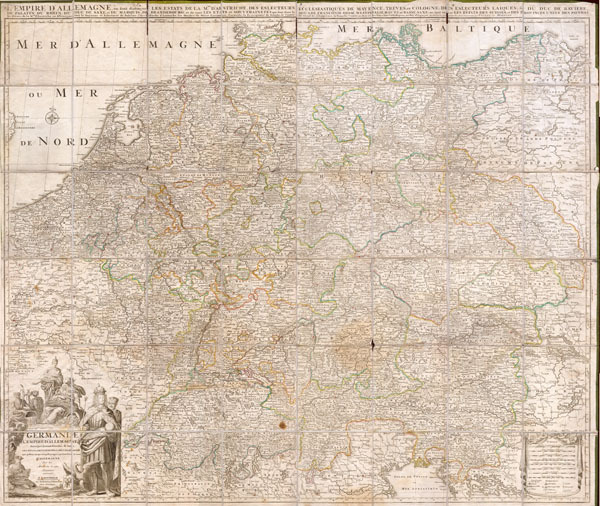 This is an extraordinary and gigantic c. 1730 map of Germany and the surrounding nations. Map is presented in case or pocket format on 48 linen backed panels. Covers most of what is today central Europe from eastern France and the Netherlands to Poland and Hungary to northern Italy and Greece. Large decorative cartouche in the lower left depicts both the royalty and trade riches of the region. Produced by the firm of Coven's and Mortier, undated by likely about c. 1730. Covens and Mortier (1721 - c. 1862). The Amsterdam publishing firm of Covens and Mortier was the successor to the extensive publishing empire built by Frenchman Pierre Mortier (1661 - 1711). Upon Mortier's death in 1711 his firm was taken over by his son, Cornelius Mortier (1699 - 1783). Cornelius married the sister of Johannes Covens (1697 - 1774) in 1821 and, partnering with his brother in law, established the Covens and Mortier firm. Under the Covens and Mortier imprint, Cornelius and Pierre republished the works of the great 17th and early 18th century Dutch and French cartographers De L'Isle, Allard, Jansson, De Wit, and Ottens among others. They quickly became one of the largest and most prolific Dutch publishing concerns of the 18th century. The firm and its successors published thousands of maps over a 120 year period from 1721 to the mid-1800s. During their long lifespan the Covens and Mortier firm published as Covens and Mortier (1721-1778), J. Covens and Son (1778 - 94) and Mortier, Covens and Son (1794 - c. 1862). Very good condition. Original linen backing thin in some places, but map is otherwise clean.